The Black Saturday bushfires were a series of bushfires that ignited or were burning across Victoria on and around Saturday, 7 February 2009 and were among Australia's all-time worst bushfire disasters. 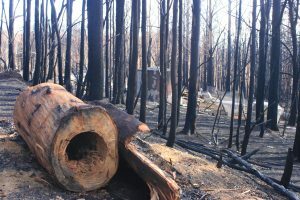 Areas within the City of Whittlesea and Shire of Nillumbik were directly impacted including Kinglake West and Strathewen. Local historian and photographer Matt Dickinson took a series of photographs immediately following the fires and has donated them to YPRL for public access. 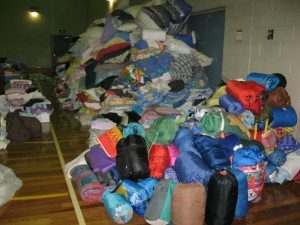 Donated food in the gym of the Diamond Creek Community Centre, from the many many thousands of anonymous donations which quickly piled up to the ceiling immediately following Black Saturday fires on February 7 2009. Following the devastation of the fires Yarra Plenty Regional Library’s own mobile library resumed service to the fire affected Shires of Nillumbik and Whittlesea as soon as the roads were reopened. The mobile library provided a touch of normality for the residents contributing to the initial recovery. It is now ten years since that fateful day. Gradually items have been added to our local history collections at both Eltham and Mill Park libraries, including other photograph collections. These items will be held permanently representing a significant event in our local history. If you are interested in commemorating Black Saturday, Whittlesea Library is running community events in February and March. Find out more. Nillumbik Shire Council and City of Whittlesea are also hosting several events and services.